Since 1984, AAUW Morgan Hill’s annual Wildflower Run has raised funds in support of education and equity for women and girls. The Wildflower Run is a 501(c)3 non-profit event, completely organized and staffed by branch and community volunteers; every dollar above and beyond the cost of putting on the event goes toward a range of philanthropic interests in support of our mission. While our first Wildflower Run raised just $1000, the event has grown steadily, enabling us to continually expand the number of scholarships we offer and the number of organizations and programs we support. Wildflower Fund allocations (a combination of Wildflower Run registrations, corporate sponsorships, and individual donations) reached a record $51,000 in 2017. 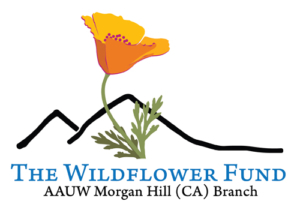 Since the establishment of the Wildflower Run in 1984, the Morgan Hill branch of the American Association of University Women (AAUW) has contributed close to $500,000 in support of education and equity for women and girls. See below for names of individuals and organizations that we have supported financially.